The California Chamber of Commerce joins the nation in mourning and remembering President George Herbert Walker Bush, who passed away on November 30 at the age of 94. President George H.W. 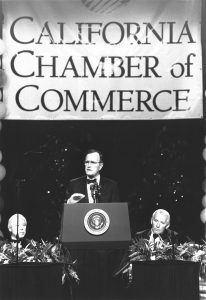 Bush at the CalChamber’s Gala Centennial Dinner on March 1, 1990. At left is Henry Eu, husband of former California Secretary of State March Fong Eu. At right is former CalChamber Board Chair Stanley A. Wainer. About 1,200 people attended the dinner, which honored CalChamber’s 100th anniversary and the growth of the state’s business community. Bush’s speech foreshadowed some advanced policies. Noting that economic growth and tighter labor markets will require businesses to run to untapped sources of talent, Bush said flexible workplace policies will allow firms “to find and keep the best talents.” He singled out telecommuting as an “exciting concept” that could reduce traffic congestion and pollution, as well as improve the quality of life. 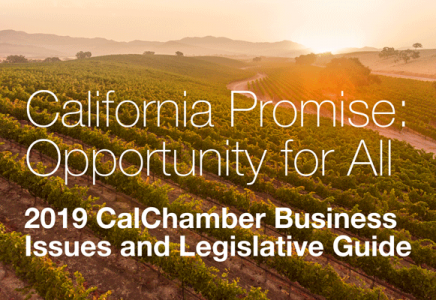 Bush remarked that California has risen from what one observer called “a state of decadence” in 1890 to “a world-class economic superpower” in the 1990s. President Bush’s comments are as relevant as ever as California’s ranks as one of the 10 largest economics in the world.